Rhinebeck, New York…..The 8th annual Art Studio Views tour, scheduled for Labor Day weekend, has expanded this year beyond the border of Northern Dutchess County to include talented artists from Southern Columbia County, linking communities that will no doubt be bustling with people who come from near and far, ready to patronize local businesses as part of the visit. This free, self-guided event will be open to the public on Saturday, September 5 and Sunday, September 6 from 11am-5pm each day, and organizers report that tourists travel from all over the tri-state area to attend. “This event has become such a success over the past eight years – not only with locals, but also an increasing number of out-of-towners who want the experience of visiting private studios of artists. The inquiries we are getting come from all over the northeast, and these art enthusiasts tend to purchase artwork from our artists, and in addition, end up supporting the community in a broader way by dining, shopping, and antiquing during their stay,” stated Joanna Hess, director of Art Studio Views 2015. Over the two days, studio doors swing open, inviting visitors into the inner workings of active and creative environments. Seeing new works in progress and items for sale is just part of the experience. Tour guests also gain the extraordinary opportunity of speaking directly with the artists about their work, experiencing the studio setting, and observing the innovative processes needed to produce these high-quality artworks. “We all love visiting museums and art galleries, but this event gives guests real insight into the creative process, and first-hand stories from the artists themselves – something that typically cannot be experienced when viewing an exhibit elsewhere,” shared Hess. In Germantown: Marie Cole, Trevor Hunter, Dana Matthews Helen Sacco, and Valerie Shaff; Tivoli: Louise Kalin, Kate Kennedy, Kevin Palfreyman, and Linda Palfreyman; Red Hook: Barbara Eichin, Dan Goldman, and Michael Scudder; Rhinebeck: Melissa Katzman Braggins, Ted Braggins, Undine Brod, Thomas Cale, Richard Chianella, China Jorrin, Christine Livesey Sally Lyon, Lisa Masciadrelli, Ann Moring, Franc Palaia, Jeff Romano, Bianca Terranova, Lucas Terranova, and Dean Vallas, and in Hyde Park: Tarryl Gabel, Eric Garrison, Carl Grieco, and Marilyn Grieco. 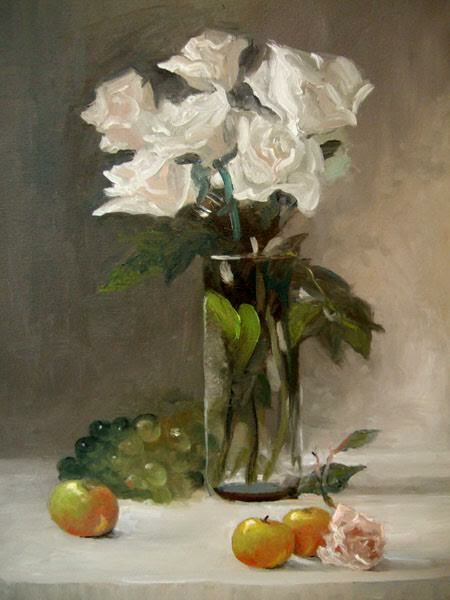 Palfreyman, L – White Roses. A sampling of all the artists work will be on display at The Atrium at Rhinebeck Bank in Rhinebeck beginning in August, offering a wonderful chance to get a sneak peek at the talent on the tour. Tours are self-guided, and visitors can pick up maps at one of the three Art Studio Views Headquarter locations: Tivoli Artist Gallery, Tivoli; Betsy Jacaruso Studio & Gallery, Rhinebeck; or the Artists’ Collective of Hyde Park, Hyde Park. Brochures are also available at the Rhinebeck Bank branches in Red Hook, Rhinebeck and Hyde Park. Services, Cale Communications, The Gardents at Rhinebeck, Grand Cru, Timely Signs, and Radio Woodstock 1001.1. Visit artstudioviews.com or email artstudioviewstour@gmail.com for more information.